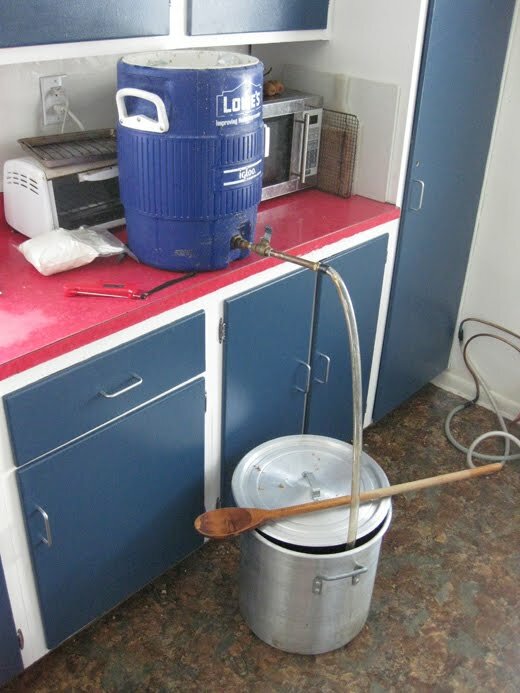 Are you a member of a local homebrew club? About a month ago, the Saturday before Christmas if you want to be precise, DC was hit by the biggest snow storm since I moved down here in 2006. 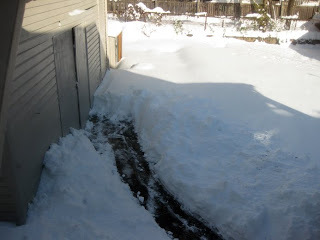 The next morning I took my shovel and carved a path through the snow from my backdoor to the garage so I could brew up a batch of something strong and dark. I wanted to create something inspired by the most interesting new Belgian brewery to open in the last ten years, De Struise Not only are their beers unique, but pretty much everything I have had from them has been darn near perfect. While Black Albert, their Royal Belgian Stout, is the beer that garners the most hype, I think their best offering is a slightly sweet, spicy, Belgian Strong Dark called Pannepot (Old Fisherman's Ale). Luckily for me Struise had PDFs posted on their website (that have since disappeared, but can still be grabbed using the Wayback Machine, translation required) that listed the ingredients used in each of their beers as well as the color/gravity/IBUs, making a clone recipe pretty easy to piece together. My version of the recipe starts out simple enough with lots of pils malt. I was inspired to use a blend of German, Belgian, and French pils by an interview I heard with Ron Jeffries (of Jolly Pumpkin) on the Jamil Show, in which he said that uses a blend of different base malts to hearken back to the days before consistent malt modification and to provide a more balanced malt foundation. On top of the base malts I used some Crystal 120 (I would guess that the original uses Special B for its "Caramel mout", but I didn't have any on hand), a touch of dark malt (a blend of Carafa, Chocolate, and Coffee malts), and some dark candi syrup. Pannepot also contains a bit of flaked corn to boost fermentability, which I also used awhile back on my Big Funky. The hops are pretty restrained at less than 30 IBUs for a 10% ABV beer, so I didn't mind swapping Willamette and Saaz in for the Bramling Cross and Hallertau Mittelfruh called for. For yeast Struise uses T-58 (a dry strain that seems to be gaining in popularity), but I had some Wyeast 3787 around (which is very similar) from my Clear Sugar Experiment, so I decided to use that instead. I was able to dig up the fermentation schedule for Pannepot posted by one of the brewers (reproduced at the end of the post), but I am not sticking too it very closely. The big twist compared to other Belgian Strong Darks (Quadruppels) is the spicing: cinnamon, coriander, thyme, and orange zest. Each spice/herb seems like it could pair with the other three individually, but I will be interested to see if they all four meld harmoniously in the finished beer. I used a light hand with all of them, so worse comes to worse they will probably be playing around below the flavor threshold (which is fine since Pannepot does not have distinct notes from any of them). A few years back one of my first sour beers was inspired by Pizza Port's (now Lost Abbey's) Cuvee de Tomme, a strong dark Belgian aged in bourbon barrels with sour cherries and several strains of Brettanomyces. It turned out to be one of the better batches I have made, so I though I would give the same treatment to half of this batch. The base beer is pretty close to what I used back then, with some dark sugars, and a touch of dark malt. Other than the base beer the biggest change compared to last time was the switch I made from dark sweet cherries (all I could find at the time) to sour cherries (which are used in the commercial version), hopefully this change will up the acidity and complexity of the beer. 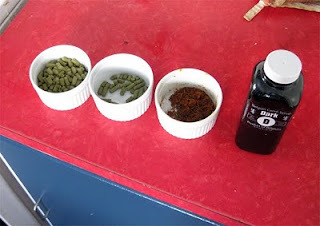 It will be interesting to see if any of the spices are apparent after the fruit/wood/bugs have time to impact the beer (Struise uses the same blend of spices in Aardmonnik - Earthmonk, a tasty Flanders Red/Bruin, so I do have high hopes). For the microbes I added the last of the Wine Barrel Flanders Red culture (which started out as Wyeast Roeselare Blend and the dregs from a bottle of Lost Abbey's Red Poppy) that also went into my Sour Cider a couple months back, as well as a touch of Al B's Bugfarm #3. Normally I like the add the bugs in primary, but in this case where I wanted to leave half the batch clean I had to wait until secondary. In slightly related news I think I accidentally drank the last bottle of my first Cuvee de Tomme inspired beer a few months back, I need to come up with a better way to inventory my batches so I know how much I have left. 2.00 oz. Willamette (Pellet 4.40% AA) @ 45 min. 0.50 oz. Czech Saaz (Pellet 3.10% AA) @ 15 min. 0.25 tsp Yeast Nutrient @ 10 min. 1.00 Whirlfloc Fining @ 10 min. 3.00 gm Coriander Seed @ 2 min. 5.00 gm Fresh Orange [email protected] 2 min. 1.00 gm Cinnamon @ 2 min. 1.00 gm Thyme @ 2 min. Could have sworn I had Special B on hand, but I couldn't find it, Crystal 120 is close enough. Half candi syrup added to pot during sparge. With that sugar, 7 gallons of 1.062 wort collected. Second half of candi syrup added with 20 min left. Not sure if this will do anything, but I do seem to get more dark fruit from earlier additions, and more caramelized sugar from late. Orange peel was fresh zest, spices pre-ground, thyme crushed. Chilled wort to 70. Yeast cake from 2 of the 5 jugs of the white sugar experiment. Pitched while giving 80 seconds of pure O2. Left at ~63 ambient for fermentation to start. Moved up to radiator after 24 hours to get it up to 75 degrees. 12/24/09 Temperature dropped to ~50 while I was out of town. 12/30/09 Temp back up to 75 on my return. Still some krausen, but the gravity is down to 1.028. 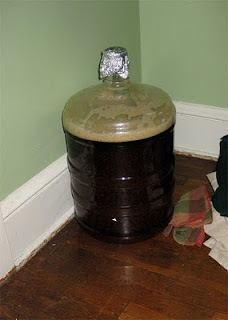 1/07/10 Racked 2 gallons into two 4L jugs, placed in the basement for a few weeks of cold conditioning before bottling. The rest of the batch racked onto 2 lbs of local sour cherries that I had vaccupacked/frozen during the summer. It got the remainder of the dregs from the Wine Barrel Flanders Red, as well as a touch of Al B's Bugfarm #3. ~1/2 oz of bourbon soaked oak as well as 1/3 cup of Maker's Mark that they had been soaking in was added as well. Left upstairs at ~62 degrees to get the bugs/yeast working on the cherries. Should be ready to bottle next winter. 4/24/10 Bottled the plain half with 1.5 oz of cane sugar. Aiming for medium carbonation. The cherry half is still fermenting. 7/22/10 First Pannepot tasting, good but a bit boozy. Gravity got down to 1.010, (90% AA, 11.5% ABV). 11/22/10 Bottled the cherry/sour portion. 2.25 gallons with 1.375 oz of table sugar. 1/27/11 The sour/cherry version turned out well, nice cherry character, well balanced. Not as sour/funky as I wanted, but I'm not surprised since I waited until after primary fermentation to add the bugs (and the base beer was more fermentable than I was anticipating). Old Fisherman's Ale is a dark ale brewed with spices. Pannepot is a term that describes the Fishing Boats from the village of De Panne. Brewed and bottled on the Deca Brewery in Woesten-Vleteren. Did you fit all 16.75 lbs of grain into that mash tun at once? I have the same Lowe's cooler and am thinking I will need to do two mashes to fit all 17 lbs of grain in for the barleywine I'm planning to brew this weekend. Unless you have a larger cooler - what size is it? Yeah all of that grain, plus ~3.75 gallons of water went into my 5 gallon mash tun. It was only 15.25 lbs of grain though, since the sugar went into the kettle directly. I have a bigger cooler ~70 qrts, but i don't use it very often. Wow! I'm going to have to try that. I sounds amazing! Thanks for posting this, I may try this recipe soon for next Christmas. I already have a Scaldis Noel clone lined up for my next brew, so it would be cool to have a heavy tripel and a quad to compare at holiday time. i had one of the best double ipas i have ever had a couple months ago and have been really interested in the differences between hops. so what i wanna do is make a single hop apa/ipa. would you suggest using as a base malt and how much? would following your sugar experiment be a good base? There was an interview/tasting with Basic Brewing Radio as well. I used Maris Otter, and a bit of Vienna and Crystal, that said I think pretty much any malt bill could work. I regularly use the T-58 yeast for my Belgians and am very happy with it. A few years back I did a run to try it out, brewing a Dubbel, Trippel and Strong Dark back to back on the same yeast cake. All three came out great. Great thing is it's so cheap you don't need a starter, just pitch two or three packets for less than or equal to the cost of a Wyeast pack. I agree, T-58 is a fantastic yeast. My most recent use of it was to make a beer somewhat similar to Orval (minus the brett). Quite good, and T-58 packs down quite nicely which makes it good for bottle conditioning. Good to see, a beer I plan to make sometime this year! I noticed that you mentioned you're using sour cherries in your second batch of CdT. Did you find these at a local farmers market, specialty food store (ie. Whole Foods) or did you buy them online? January is usually not the best season for fruit, but I have brewed a few sour beers (including a Flanders Red and a pLambic) that I would be interested in using these cherries in, but they're hard to find. I bought them last summer at the Dupont Circle farmers market near where I was living. After I got them home I took off the stems, gave them a rinse, and used my foodsaver to seal them. Since that time they have been sitting in my freezer. 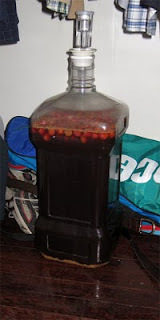 I think fresh/frozen fruit is best, but I've had decent results with dried sour cherries and sour cherry juice. Another option is sour cherry concentrate ( http://www.cherryconcentratestore.com/ ), some people swear by it and 1 cup is equivalent to 5.5 lbs of cherries. Thanks. I will keep an eye out for them as the weather begins to warm up. Wow. I had a 2006 Pannepot a couple of weeks ago, and was absolutely blown away. This is definitely one I want to take a crack at making, and now's just the right time, to lay it all down for next winter! This morning, I kegged this recipe. It's so tasty I could drink it without the carbonation. I made a couple adjustments to your recipe. My LHBS does not sell French Pils so I doubled-up on Belgian Pils. I also used Brambling Cross and Hallertau Mittelfruh hops. OG: 1.087. FG: 1.019. 9.1% abv. I'll save the tasting notes for when it's carb'd. Excellent! Glad yours stopped a bit sweeter than mine. The only reason I blend pils is when I run out of one kind and move onto a fresh sack. How hot would you let the T58 go in a recipe like this? I started at 64 but it's up to 80 already in the DC heat. I don't have much experience with T-58, but I would worry about the wort/beer getting any hotter than the low-80s. Too much opportunity for weird esters and fusel alcohol production. This looks awesome, I love Pannepot! When I go to the old Struise site I can see the pdfs listed on the right but they seem not to be working. .. is it just me? I'd love to have a look at both Pannepot and Tsjeeses pdfs. The jpg files seem to work for me but the pdfs won't download or open. ..
About a year ago, I brewed a Belgian dark strong to take advantage of a great yeast cake I had left from an earlier project based on Tart of Darkness. 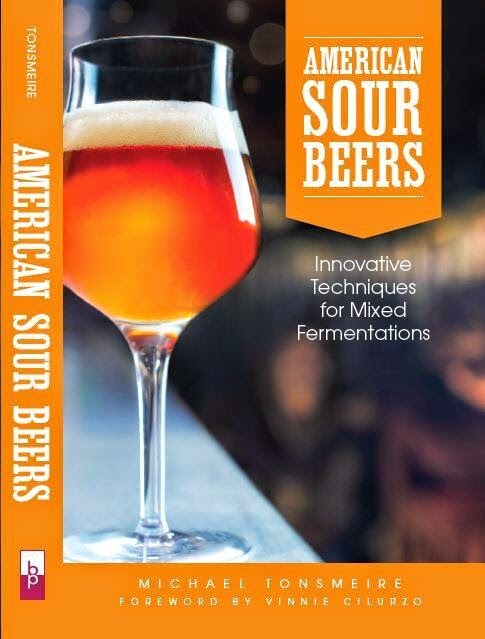 Your posts here about sours inspired by Cuvee de Tomme made me think about what direction I could go now. At this point, I have great funkiness and a very pleasing level of sourness. While I didn't add raisins in the kettle, I'd like to see what I could do to get a balance of sour cherry and raisin flavors by aging on fruit. Any recommendations for the proportion of dried sour cherries and raisins I should use for five gallons? I'd lean towards the cherries, maybe 2 lbs dried cherries to .5 lbs raisins. Raisins will likely come through more added to the fermentor than they do added to the wort (so maybe even less for a similar balance). Best of luck! Thanks--I'll let you know how it turns out next spring! I brewed a similar dark strong a few weeks ago, with T-58 and a handful of brett strains. I also added a mild spice tea of thyme, curacao, cinnamon and coriander at bottling. The crazy thing is that after two weeks in the bottle, it has become puckeringly sour! I like the sourness, but for this strong of a beer (11% alcohol, 26.5 IBU) it must be quite a crazy lacto strain. I've been doing a lot of sour beers in my fermentation vessel, using dregs and sour worting, etc, so something must've survived into this batch. Have you heard of lacto operating so quickly in such a strong beer? There's no diacytel, but might it be pedio? That certainly is impressive, try to culture it up, you might have a winner on your hands! With the speed it is more likely Lacto that Pedio, but who knows! Sounds similar to the strain Cascade uses?